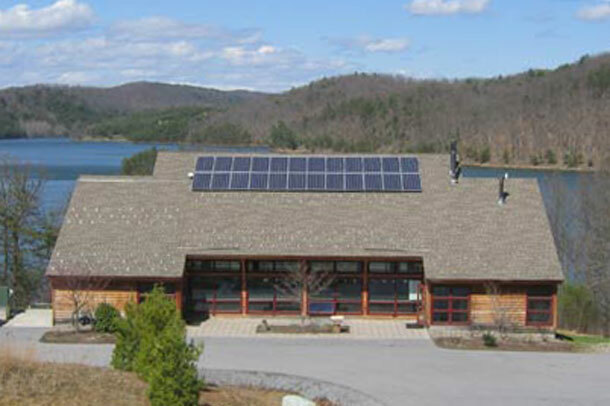 Shuster Hall is located on the shore of Raystown Lake, and serves as the main building for Lakeside Center. 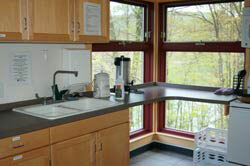 A small kitchen with a great view of the lake provides for the needs of the students and renters. It is equipped with a full sized refrigerator, stove, microwave and coffee maker. 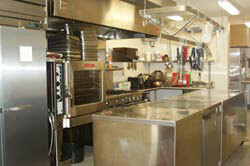 A commercial kitchen is used to provide food service during the residential semester. 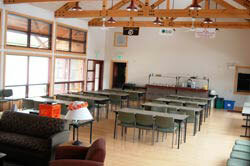 The main upstairs room features extensive windows, seating easily for 60, and up to 80, and a small sitting area with cushioned chairs and a fireplace. 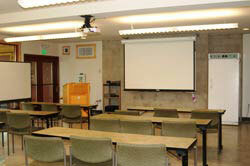 Downstairs, the classroom is equipped with a projector, screen, podium, and whiteboard.. The same classroom, as viewed from the front of the room, shows the classroom type seating in the front of the room, and the table space in the back for laboratory work. 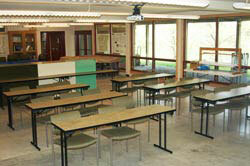 This room functions as a basic wet lab with benches and sinks.